This painting is a testament of how hard I find to paint something digitally and avoid the clean digital look. Its very hard not to overdo things. And it probably needs more work simplifying things and adding better colors. 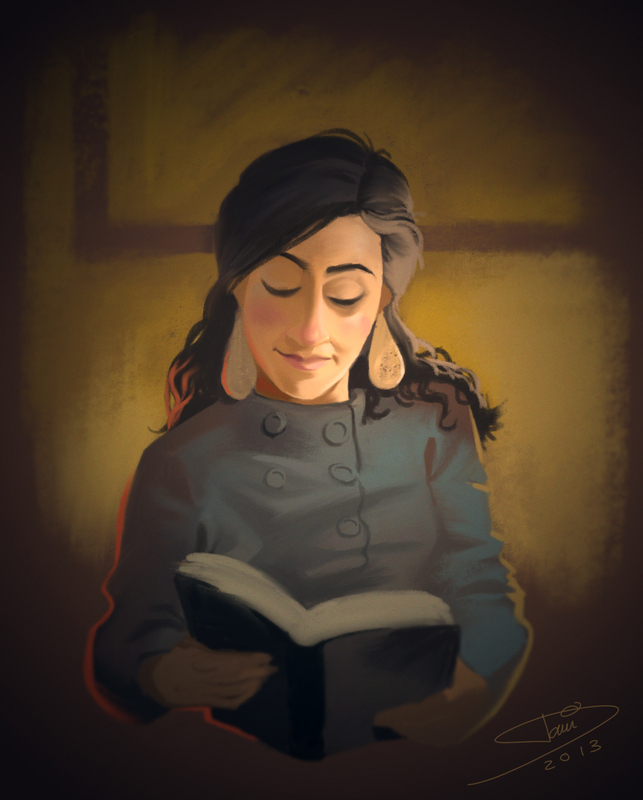 I started this on my ipad on a coffee shop.We just woke up and I thought I wanted to do a pastel-y type of sketch of my girlfriend while she read her book. It started being fun and all, but soon I started to struggle , finding the right shadows and colors and most importantly , not having a good solid pencil sketch to start with really made it more difficult. I used the smudge tool a lot to avoid that clean smooth look that you normally get in digital painting. Here's a process video, where you can see how much struggle I went through! Thanks for posting the video. I’ve never watched the process unfold. quite interesting. 🙂 Much love in the new year! Good work!,love watch the process. How did you do? What program to capture the process? This painting effect looks gorgeous and It also projects a warm feeling. On the other hand I find the process very interesting. Thank you Daniel for the video and I hope that you have had a good start to the new year. Hi Fer! I used the ipad app “procreate”. The app saves all your process automatically. When you are done with the painting it allows you to export a movie file with the process.